Pure Data comes with a set of filters useful in many different contexts. One of these filters is the [vcf~], a voltage-controlled band-pass filter. Its center frequency can be set by an audio signal, which means that it can be controlled by a LFO (Low-Frequency Oscillator). I have made a patch that simulates a wha-wha pedal for guitar. It is controlled by a LFO, and is continuously sweeping the frequency range set by the user (as if the LFO were moving the expression pedal automatically). I’ll make another patch that can be controlled by a DIY footcontroller later on. Play with the frequency range and the Q parameter to get sounds you’ll never get with a wha-wha stompbox. If necessary, you can download the patch here. 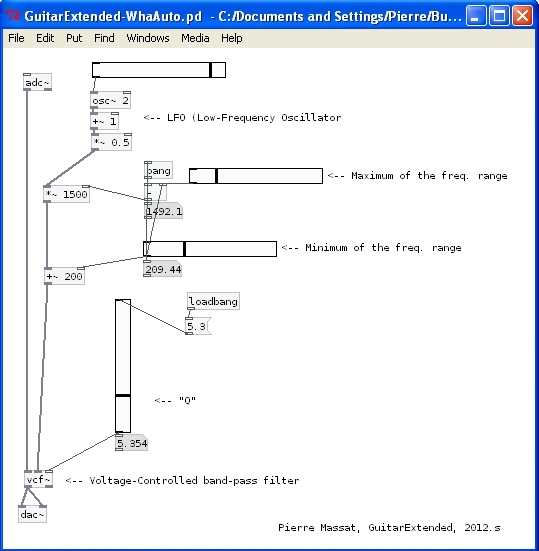 This entry was posted in Simple effects and tagged effect, guitar, pd, pedal, wha-wha. Bookmark the permalink. Nice patch, how to control the LFO with a slider (let’s say from 0-127)? Change the settings of the slider to have a range of 0-127, and connect it to the [/ 127] object. Connect the [line~] to [*~ 1500]. That’s it. Nice work, reminds me of an auto-wah project I coded while at uni. Silly bit obvious tip when working with frequencies in PD – keep the numbers within 0-127 range and use [mtof] or [mtof~] before the feed into the filter.